(equivalent of 500 printed pages) •	Specifically designed for English - Russian pair •	Built in search engine •	Easy to use category navigator •	Transcription of Russian text •	Suggestion to answers of common questions •	No internet connection required Ideal for learners, travelers and businessmen Regardless of your proficiency, the phrasebook can refresh your skills before visiting the country. This is a large application. Please, be patient when downloading and installing it Description English - Russian Audio Phrasebook covers a vast majority of topics from many everyday expressions to specific phrases and terms i.e. business and law. The current version has over 11,000 entries in 20 categories and 224 subcategories, each supporting an English phrase, a Russian phrase, a Russian audio, and a transcription of a Russian text. The innovation of this application is that our phrase entries are linked to each other conversationally. One needs only to select from the possible answers a response to a question asked. By selecting a preferred display, anyone, not knowing the cyrillic alphabet, can view it in transcription. We support our application with an available navigator and a search option, ready and able to locate a word or phrase which is needed at the moment. 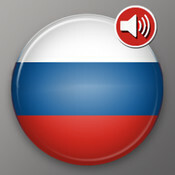 English - Russian Audio Phrasebook can be used in occasional conversations with Russians such as staying in hotels, dining, making friends, renting a car, visiting doctor, going out etc. It also features the special topics for the adopting couples or those who want to go to Russia and work with kids or orphanages. Going out and romance category include multiple phrases that you will need to get to know each other. Also the phrasebook can be used by the missionaries and religious workers who are new to the country of their mission. Even though the business terms are international, this edition has the most common of them translated. It also features the topic designed for employers who hire russian workers. As it is our belief that the language is learned by phrases, not by words, we have designed this application to organize and systemize the conversational styles and topics (whether this would be business language, sport terms or daily expressions). If you find something missing that you would expect in this Audio Phrasebook, please, send us an email. We will consider it for our next revision. Disclaimer The authors and developers are not responsible in any way for any problems related to the use of this software or the phrasebook database. We are not responslible for incorrect translation and the consequences that may occur like data, property or monetary loss caused by the misunderstanding in conversation or use of this software. Copyrights The phrasebook materials are copyrighted under the US patent and copyright law. You cannot distribute, copy, change or alter in any way the written or audio materials or this document without the written consent of the authors. ® Copyright Radif Sharafullin, Liliya A Garipova Developer: iTourSoftware in cooperation with iApps Software Solutions For non commercial use only "iPhone" and "iPod" are registered trademarks of Apple, Inc Acknowledgements Special Thanks to: George Davis Current Version: 1.0 What to expect in the next version: 1. Richer phrasebook database and possible answer suggestion. 2. Video tutorial 3. Quiz and other exciting features.